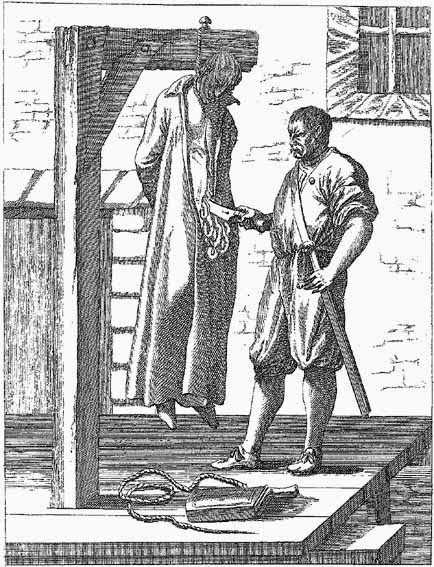 drawing shows how he was executed. Humphrey Lawrence was born in England in 1572. He met some Jesuit missionaries, and in time, he decided to become Catholic. This was against the law. But when Humphrey met Queen Elizabeth I, he bravely called her a heretic - which means a person who believes the wrong things about God. She had him arrested and killed. Most Catholics are very lucky to live in countries where it's legal to be Catholic. Today, play a version of the card game "Old Maid" in remembrance of brave Saint Humphrey Lawrence. Take three queens out of your deck of playing cards, leaving only one to be "Queen Elizabeth." All the players hold their cards so that nobody else can see them. Then, deal out all the cards. All the players hold their cards so that nobody else can see them, pulling out any pairs and laying the pairs face up in front of them. The first player to the left of the dealer selects one card (without looking) from the dealer, and if it makes a pair, that player puts the pair face up. Then the next player takes a turn, selecting one card from the first player. Whomever is left with "Queen Elizabeth" is "Saint Humphrey Lawrence" and wins the game. Saint Humphrey Lawrence, pray for us!